The Artificial Intelligence Journal (AIJ) is one of the longest established and most respected journals in AI, and since it was founded in 1970, it has published many of the key papers in the field. The operation of the Editorial Board is supported financially through an arrangement with AIJ’s publisher, Elsevier. Through this arrangement, the AIJ editorial board is able to make available substantial funds (of the order of 230,000 Euros per annum), to support the promotion and dissemination of AI research. Most of these funds are made available through a series of competitive open calls (the remaining part of the budget is reserved for sponsorship of studentships for the annual IJCAI conference). The current call has a deadline of January 20th, 2018 and a budget of 120,000 Euros. Ayanna Howard, Ph.D. is Professor and Linda J. and Mark C. Smith Endowed Chair in the School of Electrical and Computer Engineering at the Georgia Institute of Technology. As an educator, researcher, and innovator, Dr. Howard’s career focus is on intelligent technologies that must adapt to and function within a human-centered world. 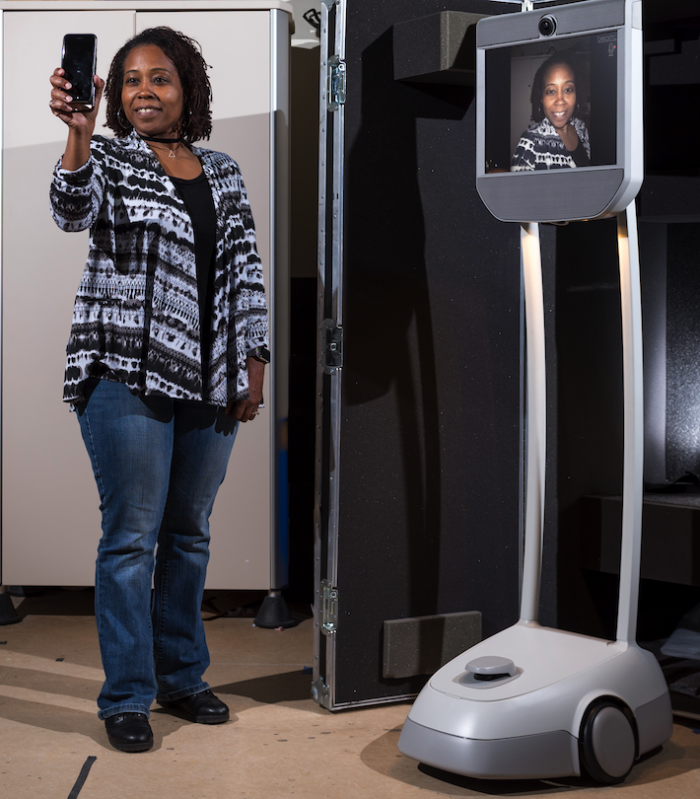 Her work, which encompasses advancements in artificial intelligence (AI), assistive technologies, and robotics, has resulted in over 200 peer-reviewed publications in a number of projects – from assistive robots in the home to AI-powered STEM apps for children with diverse learning needs. She has over 20 years of R&D experience covering a number of projects that have been supported by various agencies including: National Science Foundation, NewSchools Venture Fund, Procter and Gamble, NASA, and the Grammy Foundation. Dr. Howard received her B.S. in Engineering from Brown University, her M.S.E.E. from the University of Southern California, her M.B.A. from the Drucker Graduate School of Management, and her Ph.D. in Electrical Engineering from the University of Southern California. To date, her unique accomplishments have been highlighted through a number of awards and articles, including highlights in USA Today, Upscale, and TIME Magazine, as well as being named a MIT Technology Review top young innovator and recognized as one of the 23 most powerful women engineers in the world by Business Insider. In 2013, she also founded Zyrobotics, which is currently licensing technology derived from her research and has released their first suite of STEM educational products to engage children of all abilities. From 1993-2005, Dr. Howard was at NASA’s Jet Propulsion Laboratory. She has also served as the Associate Director of Research for the Georgia Tech Institute for Robotics and Intelligent Machines and as Chair of the multidisciplinary Robotics Ph.D. program at Georgia Tech. How did you become interested in Computer Science and AI? I first became interested in robotics as a young, impressionable, middle school girl. My motivation was the television series called The Bionic Women – my goal in life, at that time, was to gain the skills necessary to build the bionic women. I figured that I had to acquire combined skill sets in engineering and computer science in order to accomplish that goal. With respect to AI, I became interested in AI after my junior year in college, when I was required to design my first neural network during my third NASA summer internship in 1992. I quickly saw that, if I could combine the power of AI with Robotics – I could enable the ambitious dreams of my youth. The most difficult professional decision I had to make, in the past, was to leave NASA and pursue robotics research as an academic. The primary place I’d worked at from 1990 until 2005 was at NASA. I’d grown over those 15 years in my technical job positions from summer intern to computer scientist (after college graduation) to information systems engineer, robotics researcher, and then senior robotics researcher. And then, I was faced with the realization that, in order to push my ambitious goals in robotics, I needed more freedom to pursue robotics applications outside of space exploration. The difficulty was, I still enjoyed the space robotics research efforts I was leading at NASA, but I also felt a need to expand beyond my intellectual comfort zone. The professional achievement I am proudest of is founding of a startup company, Zyrobotics, which has commercialized educational products based on technology licensed from my lab at Georgia Tech. I’m most proud of this achievement because it allowed me to combine all of the hard-knock lessons I’ve learned in designing artificial intelligence algorithms, adaptive user interfaces, and human-robot interaction schemes with a real-world application that has large societal impact – that of engaging children of diverse abilities in STEM education, including coding. As a Ph.D. student, I wish I had known that finding a social support group is just as important to your academic growth as finding an academic/research home. I consider myself a fairly stubborn person – I consider words of discouragement a challenge to prove others wrong. But psychological death by a thousand cuts (i.e. words of negativism) is a reality for many early researchers. A social support group helps to balance the negativism that others, sometimes unconsciously, subject others too. If I hadn’t gone into the field of Robotics/AI, I would have chosen a career as a forensic scientist. I’ve always loved puzzles and in forensic science, as a career, I would have focused on solving life puzzles based on the physical evidence. The data doesn’t lie (although, as we know, you can bias the data so it seems to). Although I have no “typical” day – I can categorize my activities into five main buckets, in no priority order: 1) human-human interactions, 2) experiments and deployments, 3) writing (including emails), 4) life balance activities, and 5) thinking/research activities. Human-human interactions involve everything from meeting with my students to talking with special education teachers to one-on-one observations in the pediatric clinic. Experiments and deployments involve everything from running a participant study to evaluating the statistics associated with a study hypothesis. Writing involves reviewing my students’ publication drafts, writing proposals, and, of course, addressing email action items. Life-balance activities include achieving my daily exercise goals as well as ensuring I don’t miss any important family events. Finally thinking/research activities covers anything related to coding up a new algorithm, consulting with my company, or jotting down a new research concept on a scrap of paper. The most interesting project that I currently lead involves an investigation in developing robot therapy interventions for young children with motor disabilities. For this project, we have developed an interactive therapy game called SuperPop VR that requires children to play within a virtual environment based on a therapist-designed protocol. A robot playmate interacts with each child during game play and provides both corrective and motivational feedback. An example of corrective feedback is when the robot physically shows the child how to interact with the game at the correct movement speed (as compared to a normative data profile). An example of motivational feedback is when the robot, through social interaction, encourages the child when they have accomplished their therapy exercise goal. We’ve currently deployed the system in pilot studies with children with Cerebral Palsy and have shown positive changes with respect to their kinematic outcome metrics. We’re pushing the state-of-the-art in this space by incorporating additional factors for enhancing the long-term engagement through adaptation of both the therapy protocol as well as the robot behaviors. How do you balance being involved in so many different aspects of the AI community? In order for me to become involved in any new AI initiative and still maintain a healthy work-life balance, I ask myself – Is this initiative something that’s important to me and aligned with my value system; Can I provide a unique perspective to this initiative that would help to make a difference; Is it as important or more important than other initiatives I’m involved in; and Is there a current activity that I can replace so I have time to commit to the initiative now or in the near-future. If the answer is yes to all those questions, then I’m usually able to find an optimal balance of involvement in the different AI initiatives of interest. My favorite AI-related movie is the Matrix. What fascinates me about the Matrix is the symbiotic relationship that exists between humans and intelligent agents (both virtual and physical). One entity can not seem to exist without the other. And operating in the physical world is much more difficult than operating in the virtual, although most agents don’t realize that difference until they accept the decision to navigate in both types of worlds. December is a busy month for AI Policy activities. This blog post is a summary of the important topics in which SIGAI members are involved. Subsequent Policy blog posts will cover these in more detail. Meanwhile, we encourage you to read the information in this post and participate in the IEEE Standards Association December 18th online event on Policy for Artificial Intelligence. As reported in previous posts, members of SIGAI and USACM have been working closely with IEEE colleagues on ethics and policy issues. Ethically Aligned Design: A Vision for Prioritizing Human Well-being with Autonomous and Intelligent Systems (A/IS) encourages technologists to prioritize ethical considerations in the creation of A/IS systems. EADv2 is being released as a Request For Input. Details on how to submit public comments are available via The Initiative’s Submission Guidelines. Policy for Artificial Intelligence: The Power of Imaginaries, will feature Konstantinos Karachalios (Managing Director, IEEE-SA; Member of IEEE Management Council), Nicolas Miailhe (Co-Founder and President, The Future Society; Harvard Kennedy School, Senior Visiting Fellow, Program on Science Technology and Society and member, the IEEE Global Initiative on Ethics of Autonomous and Intelligent Systems and Cyrus Hodes, Director of the AI Initiative with The Future Society at Harvard Kennedy School. John C. Havens, Executive Director, The IEEE Global Initiative on Ethics of Autonomous and Intelligent Systems, will moderate. Nominations are solicited for the 2018 ACM SIGAI Autonomous Agents Research Award. This award is made for excellence in research in the area of autonomous agents. It is intended to recognize researchers in autonomous agents whose current work is an important influence on the field. The award is an official ACM award, funded by an endowment created by ACM SIGAI from the proceeds of previous Autonomous Agents conferences. The recipient of the award will receive a monetary prize and a certificate, and will be invited to present a plenary talk at the AAMAS 2018 conference in Stockholm, Sweden. Previous winners of the ACM SIGAI Autonomous Agents Research Award are: David Parkes (2017), Peter Stone (2016), Catherine Pelachaud (2015), Michael Wellman (2014), Jeff Rosenschein (2013), Moshe Tennenholtz (2012), Joe Halpern (2011), Jonathan Gratch and Stacy Marsella (2010), Manuela Veloso (2009), Yoav Shoham (2008), Sarit Kraus (2007), Michael Wooldridge (2006), Milind Tambe (2005), Makoto Yokoo (2004), Nicholas R. Jennings (2003), Katia Sycara (2002), and Tuomas Sandholm (2001). For more information on the award, see the Autonomous Agents Research Award page. Anyone can make a nomination. Nominations should be made by email to the chair of the award committee, Jeff Rosenschein (jeff@cs.huji.ac.il), and should consist of a short (< 1 page) statement that emphasizes not only the research contributions that the individual has made that merit the award but also how the individual’s current work is an important influence on the field. NOTE: a candidate can only be considered for the award if they are explicitly nominated. If you believe that someone deserves the award, then NOMINATE THEM — don’t assume that somebody else will!